I started 2009 with a bracing walk around Worcester Park to refresh myself after the excesses of the night before. Passing through Longfellow Road, I see that The Acorn Project (about whom I blogged way back in November 2007) have made good on their promise to refurbish the second part of the Rosa Smith Playground which is now equipped with a brand new basketball court. The Hamptons had clearly been the subject of much merriment and celebration at the stroke of Midnight. The viewpoint at the top of the hill in Mayflower Park was apparently very busy with revellers gathering to get a glimpse of the spectacular fireworks display in Central London (10 miles away, as the crow flies). Even the police were there to keep order. Evening all! Perhaps you were at The Hamptons last night and can tell me whether it's worth going there to view the London fireworks? As usual, those celebrating were much more proficient and making a mess than they were at clearing it up afterwards, so it was left to some community-minded residents to clear up the party debris. 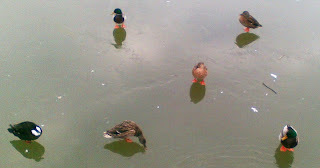 Meanwhile for the ducks the frozen ponds provided a confusing (but comical) start to 2009. From The Hamptons it was off through the fields behind Green Lane Primary School and into the Sir Joseph Hood Memorial Playing Fields. Technically, the playing fields and parks are in Motspur Park, in the shadow of the gasometers - for those of you who have never ventured there, they are well worth a visit being probably one of the best-equipped and maintained local parks in the area with tennis/basketball courts, children’s playground and football pitches. Never a dull moment in Worcester Park!